You head into your Box feeling absolutely pumped for your workout today. You throw open the doors, throw a double gunpoint at your friends with your hands…and all of your stuff falls out of your grasp. Truthfully, it’s been a pain since Day One to pack your CrossFit kicks, towel, water bottle, and personal jump rope into the gym. There has to be a better way to keep everything stored without having to resort to a smelly cinch bag. Luckily, what you have here is the ultimate guide to “CrossFit bags,” packs specially designed to hold all things CrossFit. We’ve compiled a list of 5 bags – with 2 variations – so you get to choose which gym bag is best equipped for your style and workouts. 1 Why Do We Need CrossFit Bags? Why Do We Need CrossFit Bags? Instead of bringing a simple duffle or your old high school backpack (really? ), you should have a bag that can handle whatever CrossFit can throw at you. CrossFit bags fit everything you need for a workout one day, can store all of your equipment for a rock climb the day after, and then use it as a carry-on for your next CrossFit competition around the country. The perfect weekly pack for WODs (shoes, towel, water, supplements, wraps, belt, extra clothes and flip-flops for after). Quick travel: Three days’ worth of clothes, your CrossFit trainers, carry-on liquids, and more can fit into these amazing packs for a long weekend. Competition: Of course, you can easily put anything you need for a CrossFit competition into these compact, multiple-slot bags. If you aren’t a serious CrossFitter, then it might not be prudent to purchase one of these. However, if you are serious – and we’d like to think you are if you’re reading this – then it is most definitely worth the investment. They’re built to last a long time, sturdy and rugged, plus they have numerous compartments to keep your sweaty clothes and shoes away from your water bottle and gadgets (GoPros, phone, etc.). Now don’t go and buy the first CrossFit duffle bag you see in Amazon’s search results. You need to make your decision based on what you’d use the bag for the most. Also, there are specific details you might covet more in a CrossFit bag than others. What are you toting into the Box? How much are you bringing to the gym day in and day out? This determines how big you want your CrossFit gym bag. 1. Will you use it for longer than 3 hours? What I mean by that is if you want your CrossFit bag to handle your daily WOD stuff, you can get away with a smaller satchel. But if you want the ability to pack for bigger events and travel, it’s best to go big with your bag. 2. Do you prefer duffel or backpack style? By design, a CrossFit duffel bag is bigger in size than packs that go on your back. This is a preference question, but it dictates how much room you have to fit your workout essentials. 3. What types of things are you bringing to your workouts? You pack extra clothes, your lifters, a water bottle, but you also bring your laptop or your camera for Box photo ops. Depending on the equipment you bring, you might want different compartments to keep dirty, sweaty things away from clean, high-tech things. This means more space is required. This is a testament to how hard you use your CrossFit bag. If you’re putting a ton of equipment in your bag, having a durable CrossFit duffel or backpack is necessary. Plus, if you travel with it or bring it out and about, you’ll want a bag that can withstand the ruggedness of the outdoors. Rule of thumb: Durable is always the way to go. The sturdier the material, the better. Nylon, polyester, canvas, reinforced grips, comfortable straps, and high-quality zippers are specs to look for in your CrossFit bag. An important quality for any gym bag is breathability, or keeping your bag – and everything in it – as fresh as possible. You need a bag that’s well ventilated, to avoid dealing with microbes and other bacteria. If anything, this keeps your bag from reeking of old sweat and God knows what else. Keeping things clean and non-smelly is important for your health, and your CrossFit bag should embody this sentiment. The only true backpack on our list, the King Kong Backpack II is incredible for those who want a daily workout companion. While it isn’t as big as a duffel, if you’re in the market for a backpack then size isn’t a major factor for you. Made of military-spec 1000D nylon and high-density EVA foam padding lining the top pocket, you can rest assured your valuables are safe in this durable backpack. You can pack it by laying it flat, almost like a duffel, and it has separate compartments for your wallet, accessories, phone (+ headphone outlet), and even your shoes! The shoe spot is located on the outside of the pack, to avoid odors inside the main pack. It’s the priciest bag on our list. But what you get with that is long-term use, heightened durability, superior organization, and a sleek design. So if that’s how you want to roll into your Box, choose the King Kong Backpack II. This is another King Kong option. While still slightly expensive, you get a ton of bang for your buck. Just like the backpack, this Original duffel has military-spec 100D nylon; however, unlike the backpack, you get double-stitched seams and heavy-duty shoulder strap clasps for the duffel. It can fit 11.9 gallons and has separate compartments made of water-resistant material. 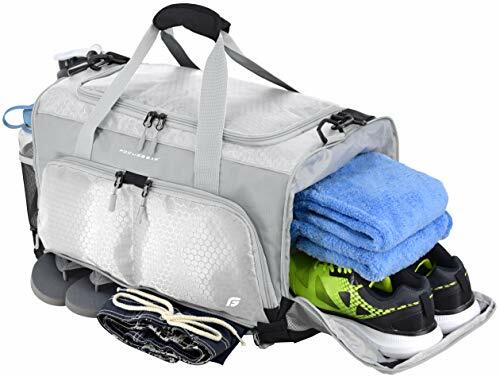 This is nice to have if you use your bag as a wet bag for towels, used clothes, or swimwear/other swimming gear. With multiple compartments, reinforced materials, and a ton of space, this duffel is for the ultimate CrossFit athlete. You’re serious about CrossFit…your duffel should be too. This is for the CrossFit athletes that care about breathability over everything else. The Venum “Trainer Lite” Sports Bag is made with comfort and ventilation in mind. It’s made of 100% polyester, with mesh panels that allow for extraordinary breathability. The shoulder straps are padded, so the duffel isn’t digging into your shoulder. The main pocket is gigantic, so it can fit the bigger things in your workout regimens, such as boxing gloves, shin pads, or your CrossFit shoes. Of course, it also has extra pockets for your accessories and clothes. This is the first super-affordable duffel on the list. The great thing is you’re not compromising on value with the Venum “Trainer Lite” Sports Bag. This duffel screams CrossFit. A crowdsourced product, the Focus Gear Gym Bag was made by CrossFitters, for CrossFitters. It does everything you need a bag to do, at an affordable price. The company that makes this bag used real reviews of current gym bags and created a duffel that listened to the athlete’s wants and desires. It comes equipped with two bottle holders – one for your 32-oz. water bottle and one for your shaker bottle – an inside pocket that fits all phones, two wet pockets (one ventilated pocket and one secret pocket) for your swimming gear and smelly workout clothes, and a huge main pouch that opens completely for easy packing. The zippers and straps are incredibly durable, and it has mesh walls on the outside. The Focus Gear Gym Bag is unbelievably versatile, and exactly what a CrossFit athlete is looking for in a gym bag. This duffel is a ridiculous steal. For those who appreciate style, a crazy amount of compartments, and sturdy material go for this crowdsourced crowd pleaser! Organization and durability are what makes this CrossFit bag really alluring. The WODFitters Gym Duffel Bag is designed to keep your workout essentials in place and safely stored for the day-to-day workout grind. This bag is big. It’s dimensioned to house just about anything, so you can use it for your daily WOD, a weekend getaway, or outdoor expeditions. This duffel is made out of canvas, with metal straps and zippers. Plus it comes with a rubberized shoulder strap for ultimate comfort. It has a big main compartment and a front pocket with three separate mesh pouches for your breathable needs (wraps, athletic tape, small sweaty clothes). Two other pockets are designated for your CrossFit shoes, stored away from your clean clothes and bottles. Most likely the most durable bag on the list. Another price-friendly option, this duffel is good for those who want a no-nonsense, durable, breathable bag that gets the job done. Your bag says a lot about you when you walk into the Box. Are you someone who brings loose items cradled in your arms? Or are you a serious CrossFitter with swagger and a duffel hanging by your side? I hope it’s the latter. Find a CrossFit bag that works best for you. Decide on your style – backpack or duffel – and then arrange your daily CrossFit gear in a pile to see what specifications and designs you want for your pack. Do you need a bunch of space? Do you carry a lot of heavy-duty things and want durable material? Do you want to keep your bag fresh and stink-free? Once you have your needs figured out, check back with the list to see which one is right for you. Get a CrossFit bag that upgrades your workout. And get pumped for that workout!